Deborah Zhang was accepted to the prestigious New York Youth Orchestra as 3rd chair cellist for their 2018-19 season. She will also perform the Elgar Cello Concerto with the Scarsdale High School Chamber Orchestra in their upcoming Spring concert. Deborah has received early acceptance to the University of Pennsylvania for the 2019-2020 academic year as a pre med major but plans to study cello and play in the orchestra as well. Chloe Ji, Kevin Niu, Byranna Huang, Bryan Chung, Ronald Feng, and Hazel Tjaden performed with the Westchester Junior All County for grades 6-7 and Joyce Lu and Jocelyn Hung performed with the Intermediate All County for grades 8-9 on March 3, 2019 at SUNY Purchase. Chloe Ji, was chosen as principal cellist for the 2018-2019 season of the Greater Westchester Elementary String Orchestra. Joyce Lu and Karen Lee were selected as members of the Hoff Barthelson Festival Orchestra for the 2018-219 season. Chloe Ji and Bryanna Hung were selected as members of the Greater Westchester Elementary Strings for the 2018-19 season and Hazel Tjaden and Jocelyn Hung were selected as members of the Greater Westchester Junior Strings for the 2018-19 season. Jacopo Gherardi and Lauren Cho were selected for the Greater Westchester Symphony Orchestra for the 2019-19 season. Hazel Tjaden was principal cellist of the Westchester County Elementary String Orchestra and Bryan Chung was assistant principal. Jocelyn Hung and Joyce Lu were members of the All-County Intermediate Orchestra. Deborah Zhang was principal cellist and Karen Lee a section cellist in the Hoff Barthelson Festival Orchestra. Deborah Zhang was principal cello of the Area All State Symphony orchestra. Sam Cole and Hannah Osinoff were co-principlals of the Greater Westchester Symphony Orchestra. Karen Lee and Deborah Zhang were selected to participate in the Green Mountain Music Camp in Vermont. Bryan Chung and Hazel and Maxine Tjaden attended the Suzuki Institute at Ithaca College. Jacopo Gherardi was selected to attend the New York State Summer of the Arts at Skidmore College as part of the orchestra program. Cameron Wong was selected for New York All State Orchestra and was awarded the third chair position. Sam Cole was of the Area All State String Orchestra. Deborah Zhang was principal cellist of the Area All State Symphony Orchestra. Lauren Cho, Jacopo Gherardi, Emily Kopp, Karen Lee, Harry Liu, and Hannah Osinoff were section cellists in the Area All State Symphony Orchestra and String Orchestra. Jocelyn Hung, Karen Lee, Joyce Lu and Maxine Tjaden and were members of the All-County Intermediate Orchestra. Hazel Tjaden was principal cellist of the All-County Elementary String Orchestra. Bryan Chung was a section cellist in the All-County Elementary String Orchestra. Lauren Cho, Jacopo Gherardi, Emily Kopp, Karen Lee, Harry Liu, Hannah Osinoff, and Deborah Zhang all performed with the Greater Westchester Symphony Orchestra. Cameron Wong (senior at Scarsdale High School) was awarded the 3rd chair cello position in the New York All-State Symphony Orchestra which performed at the Eastman Theater in Rochester, New York. He was the only All-State cellist from Westchester County this year. Cameron Wong received the principal cello chair at Westchester County Area All State. Sam Cole, Emily Kopp, Brandon Kim and Hannah Osinoff have been selected as members of the cello section of the Westchester County Area All State Orchestra. Sofia Checa performed at the Chinese consulate as part of a cello ensemble consisting of former National Youth Orchestra Members. Cameron Wong has just received notification that he has been accepted into New York Conference All State Orchestra! Joyce Lu has been chosen as principal cello and Hazel Tjaden as assistant principal cello of the Greater Westchester Elementary String Orchestra. Lauren Cho, Jacopo Gherardi, Karen Lee and Maxine Tjaden will perform with the Greater Westchester Junior Strings. Therese Bonoan, Sam Cole and Hannah Osinoff have been selected as members of the Greater Westchester Youth Symphony Orchestra. Deborah Zhang was selected as a member of the cello section of the Hoff Barthelson Festival Orchestra. Sofia Checa is touring China with the National Youth Orchestra of the USA conducted by Charles Dutoit. Check out the National Youth Orchestra Facebook page for pictures and updates of their concerts. Deborah Zhang and Jonathan Lin are at the famed Interlochen Arts Camp in Michigan. Alex Basescu attended the Cello Institute in California. Cameron Wong will be attending the excellent New York State Summer School of Orchestral Studies in Saratoga, New York. Congratulations to 8th graders Deborah Zhang and Jonathan Lin who were accepted to study at the highly acclaimed Interlochen Summer Music Academy this coming summer. They will have to the opportunity to perform orchestral, chamber and solo works. Congratulations to Joyce Lu and Maxine Tjaden who were selected to perform with the All-County Elementary Orchestra and to Lauren Cho, Sam Cole, Emily Kopp and Jonathan Lin who performed with the Intermediate All County Orchestra at SUNY Purchase Center for Performing Arts. Congratulations to 11th grader Sofia Checa upon her acceptance to the National Youth Orchestra of the United States. The orchestra will tour China this summer under the direction of Charles Dutoit and the sponsorship of the educational arm of Carnegie Hall. This is a wonderful opportunity and honor for Sofia since it was a very competitive audition process. Only 12 cellists were chosen from the entire USA and Sofia is the only cellist from New York State. Musicians are required to submit a performance video of orchestra excerpts and a solo with pianist, a verbal video which addresses several given topics and a written essay. Sofia recorded a portion of the Dvorak Cello concerto with Nely Burla as pianist and the required orchestra excerpts in early September 2014. All other materials were submitted in November, 2014 and the decisions were announced on Friday, Feb. 6. The year is off to a good start as many students return from music camps and begin the year in school and special youth orchestras. Sofia Checa has been chosen as assistant principal cello of the New York Youth Symphony. Maxine Tjaden is serving as principal cello and Joyce Lu as assistant principal cello of the Greater Westchester Elementary orchestra. Sam Cole has been chosen as principal cello of the Greater Westchester Junior Strings. Lauren Cho, Jacopo Gherardi, Hannah Osinoff and Debbie Zhang are members of the cello section of the Greater Westchester Junior Strings. Therese Bonoan is a member of the cello section of the Greater Westchester Youth Symphony. Alex Basescu is a member of the Hoff Barthelson Festival Orchestra. Cameron Wong recently was selected as assistant principal cello of the Area All State Symphony Orchestra which performed at Suny Purchase in November 2014. Sofia Checa will perform with the New York Conference All State Symphony in Rochester, NY at the NYSSMA winter conference in December 2014. Lauren Cho, Sam Cole, Emily Kopp and Jonathan Lin have been invited to perform with the Area All State Intermediate Orchestra in the spring of 2015. Surin Ahn performed the Tchaikovsky Rococo Variations with the Mamaroneck High School Orchestra on May 20th. The performance was a great success and a wonderful way to finish off her senior year in high school. Surin will graduate Salutatorian of her high school class of 2014 and will attend Princeton University in September where she will study engineering and cello performance. Edouardo Honig will graduate from Hastings High School and attend UCLA as a physics major in September. He also plans to play in the university orchestra. Edouardo was soloist in the Couperin Suite for solo cello and string orchestra with the Hastings High School Orchestra in their winter concert in December 2013. Several students have been accepted into summer music festivals. Sofia Checa was accepted into the Boston University Tanglewood Institute Young Artists Orchestra and also the Meadowmount School of Music. Lauren Cho and Deborah Zhang were accepted into the Manhattan School of Music Summer Camp. Deborah Zhang was also accepted into Greenwood Music Camp. 8th grader, Brandon Kim was chosen as a finalist in two competitions. He received 2nd place in a solo competition sponsored by NYAI (New York Artist International Competition) on the first movement of the G-Major Sammartini Sonata. He was also a finalist as part of a piano quartet in a competition sponsored by KRB (the Korean Radio Broadcasting Station in Flushing). Quartet members included Brandon on cello and three high school juniors; his sister Grace and her violin teacher’s daughter and his mom’s piano student. As winners, they were chosen to perform two movements of the Dvorak Bagatelles at Carnegie Hall on Sunday, January 26, 2014. Senior, Surin Ahn was accepted into Princeton University under Early Decision. She is excited to have the opportunity to major in engineering and study cello under the performance diploma program. All cello students performed solo in recital at the Dobbs Ferry Woman’s Club for the public, parents and friends. 4th grader, Joyce Lu was accepted to the 2014 Westchester All County Elementary Orchestra and is excited to be one of four students selected to compete for first chair cello of the orchestra during the first rehearsal. Senior, Surin Ahn was chosen as third chair cellist of the New York All State String Orchestra which performed at the Eastman Theatre in Rochester for the New York State School Music Association Conference. 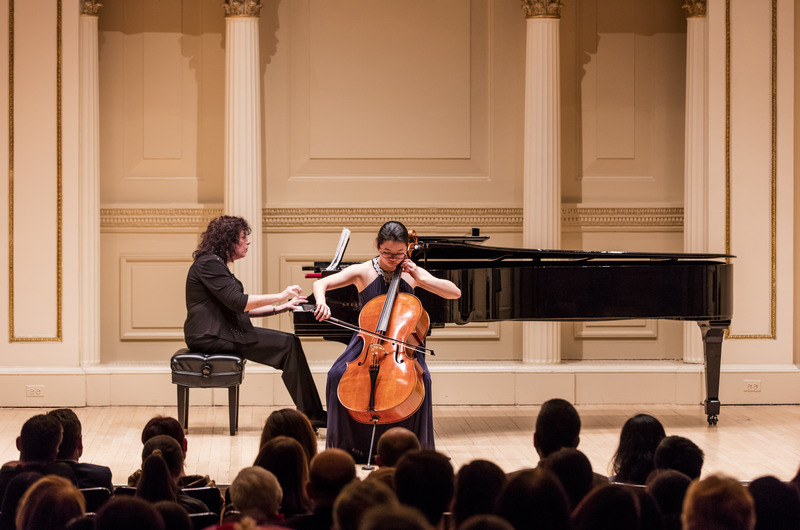 Sophmore, Sofia Checa was chosen as principle cellist of the New York Youth Chamber Orchestra and third chair cellist of the New York Youth Symphony Orchestra, both of which perform their season concerts at Carnegie Hall in NYC. Much progress has been made by many students who have taken lessons from me over the summer and/or attended summer music camps. I hope that students will blog on this page about their camp experiences! Surin Ahn has returned from the well-known Meadowmount Music Festival to impressive reports about her time there. She was a student of the famed Tokyo quartet cellist, Clive Greensmith and performed the first movement of the Haydn D major concerto for his master class. Sofia Checa has returned from the Interlochen Arts Academy where she received a full scholarship to participate in their highly selective string quartet program and was a student of Astrid Schween. Sofia also performed with their top orchestra and was selected as the first chair cellist. Deborah Zhang has returned from Point Counter Point music camp and blogged about her experience on this page. I received a note from her instructor that was extremely complimentary about her performance and progress during her time there. The regular lesson schedule for 2013-14 begins on Saturday, September 7. I continue to schedule individual summer lessons until that time. I look forward to seeing everyone and hope that the beginning of the school year will bring with it renewed energy and new and exciting opportunities. Many students have exciting musical plans for their summer vacation! Surin Ahn will attend The Meadowmount School of Music (a 7-week summer school for young violinists, violists, cellists, and pianists training for professional careers in music). Her focus will be chamber music and solo performance. Sofia Checa has been awarded a full scholarship to attend the Interlochen Summer Arts Camp where she will participate in the quartet program and is a finalist in the concerto competition. Deborah Zhang will attend the Point Counterpoint music camp in Vermont where she will study chamber music and orchestral repertoire. Edouardo Honig will attend the summer orchestra program at Ithaca College where he will study chamber music and participate in regular orchestra rehearsals and performances. Sheng Guo will attend Western Connecticut State University summer orchestra program. Freshman Sofia Checa performed the Saint-Saens Concerto in a minor for the pre-collegiate cello master class. She received many compliments from attendees and very helpful and positive critique from the clinician. Point Counter Point was a very fun and educational chamber music camp. There were many levels of advanced players who went there. It was a great experience to play with string musicians from around the world. The music was fairly easy but when adding details and embellishing the piece, it was suprisingly hard. The staff is very knowledgeable and has helped a great amount to young musicians attending PCP. The counselors were very nice and welcoming, they helped the nervous kids away from home feel more relaxed. They created regular fun activities like any other camp would, for the whole camp to enjoy. There is a beautiful lake beside the camp with a nice tiny beach to play on. The Chef’s food was very good, and they were nice to provide gluten-free kids and vegetarians different food from the rest of the campers. PCP is an amazing camp that I hope to attend again! Wow! I am just a beginner.